Do Italians really drink less alcohol than Americans? But before I get into the technical part of this blog, I want to show the results of a little 'contest'. I asked my friends to submit their pictures they thought would best go with this blog. There were a *lot* of great entries! And the winner is Stuart - it appears he single-handedly brings up the per-capita average wherever he drinks! As I looked more closely, a couple of things made me distrust their graph ... I thought it odd that the y-axis started at 5 instead of zero, and that they would pick this proportion (taller than wide) for a time-series graph. Both of these techniques can be used to create deceptive graphs. But there was one thing still lacking, from an analytic point of view. The spreadsheet also contained data for several other countries, so I thought it would be useful to show them too (as light gray lines in the background). This allows you to see the 5 countries 'in context' with the other countries. It's not as pretty a graph, but I think it's a good additional way to look at the data. So, what's your theory as to why the alcohol consumption in some countries has been changing over time (at least, according to this data)? Do you have any special insight or inside-information you can share? One thing that comes to mind is that people maybe drinking the same amount of fliuds but the alcohol content is less. For example, in the 1970's you would have two beers after your curling game and the alcohol content would be 6%. Now after your curling game you have two beers, but now the alcohol content is 3%. Thus the amount of fluid that one drinks is the same but the alcohol density is lower. There has also been a movement away from hard liquor to coolers and "lite" wines; drinks with lower alcohol content. Same volume but lower density. Ahh - that sounds plausible! As to why the Italians are lagging ... I would suspect it might be related to Italy's population decline or maybe their money troubles. 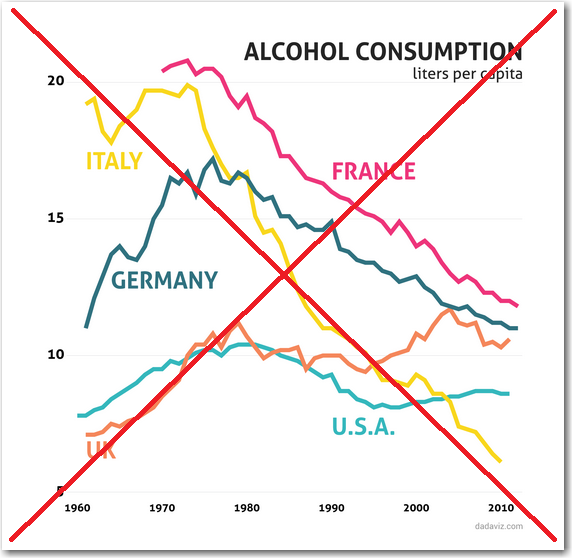 Yes, Italians really drink less, thanks for repeating and remixing the original graph. There's nothing wrong with truncating the y-axis on this line graph. In my view there are 2 points missing here. First, the strength of the alcohol. Wouldn’t you agree that 1 Liter of 96% pure ethanol is somewhat more effective (in making people drunk) than 1 Liter of 6% alcoholic beer? Therefore, when we compare alcohol consumption by volume only it might be that we compare apples to oranges (or grapes to grains). 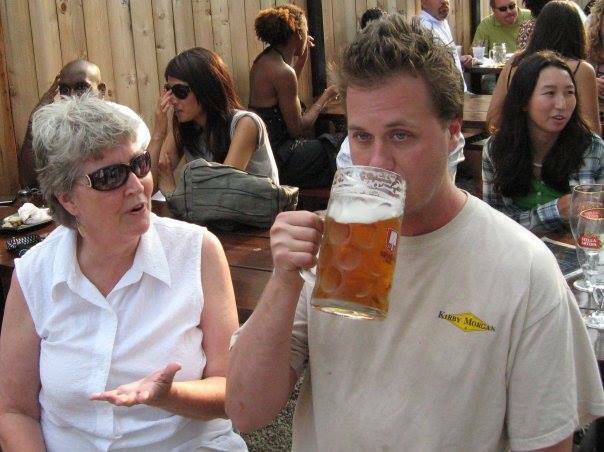 Shouldn’t we compare Liters*Strength/Person ? Secondly, where are other alcohol-consuming countries? Russia, Ukraine or Moldova for example. I suspect that bringing them into the picture would dwarf Italy and USA altogether and make their difference statistically insignificant. It’s just a hypothesis. Nice graphs. I would be interested to see how the Dutch and U.S. graphs compare. Especially, before and after 2004. Oh, by the way. I migrated to the U.S. in 2004.